When WatchOtaku, Paul Hubbard read my review of the Armida A6, he asked if I might like to try his Armida A8. Needless to say, I was all over it. 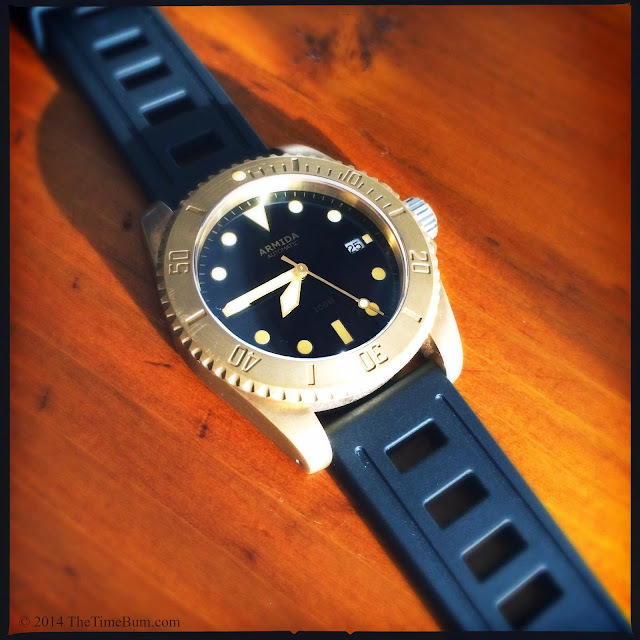 I was already impressed with the quality of my A6, and the big, brass, A8 diver was high on my list of watches I wanted to review. When it arrived, I quickly popped it onto the supplied rubber strap and wore it around the house for the afternoon. My wife noticed right away. "That's a nice watch" she said. "Is it new?" You might think this is a common question in the Bum household, but you would be wrong. Watches pass through my possession all the time and Mrs. Time Bum finds few of them worthy of note. To the contrary, she most often tells me the new arrival I am so excited about looks a lot like something else I own. I will then sputter something about the tiny distinctions in case design or dial layout. "The same?" I cry, "But that one has round markers, and this one has square markers!" When I am done geeking out, I must admit that most of them really do look quite similar – particularly the dive watches: round stainless case, black dial and bezel, white markers... Yeah, Mrs. Time Bum is right. Enter, the A8. 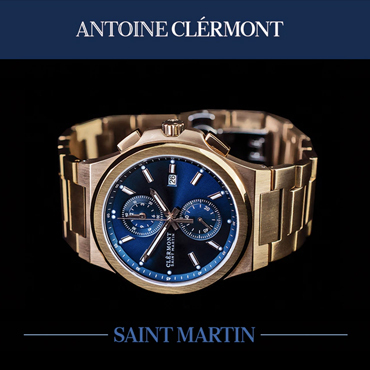 This watch earned her attention with a combination of distinctive features, most notably, the brass case. Bronze is an alloy comprised of copper and other metals. Brass is a copper alloy containing more than 11 percent zinc. It ages very much like other bronze alloys do, but it tends to be yellower and less expensive. 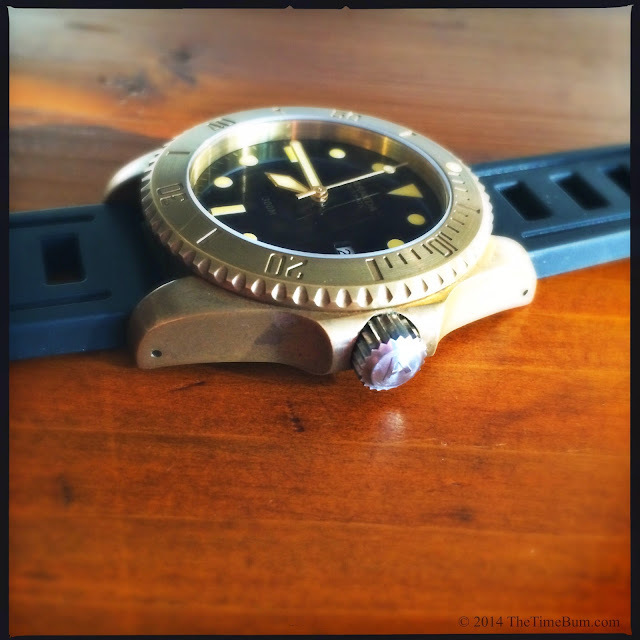 After several months of use, the brushed case and bezel on Paul's A8 had developed an even, unforced patina. The bright gold of new metal mellowing with oxidation. The result is warm, inviting, and quite unlike any other any other case material. 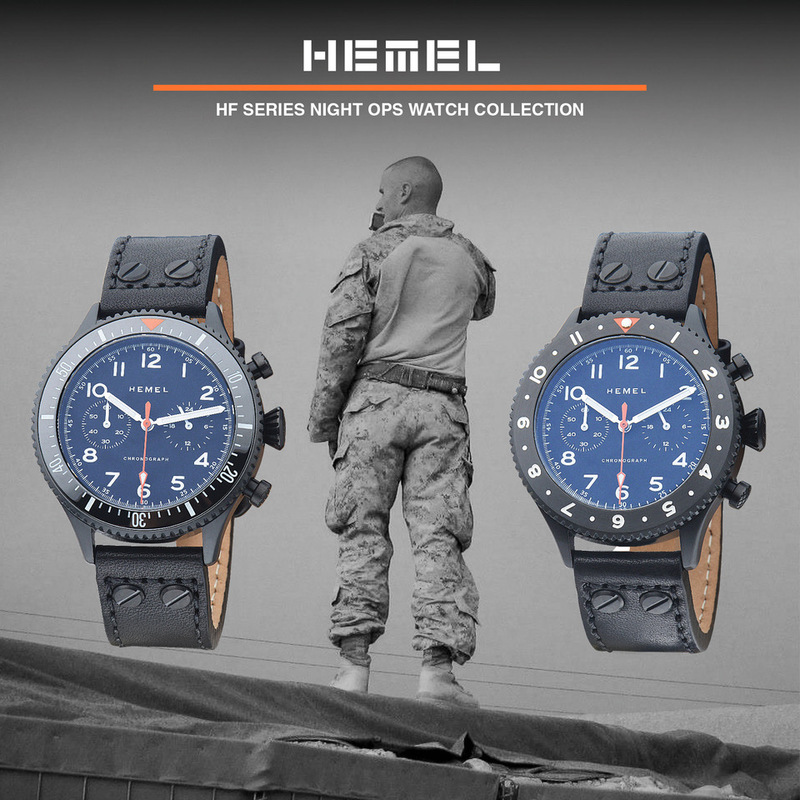 The A8 series was initially available in black or green dials, with C3 or vintage orange lume, and with or without a date window. All were shipped with two bezels: one engraved brass, the other with an aluminum bezel insert that matched the dial. 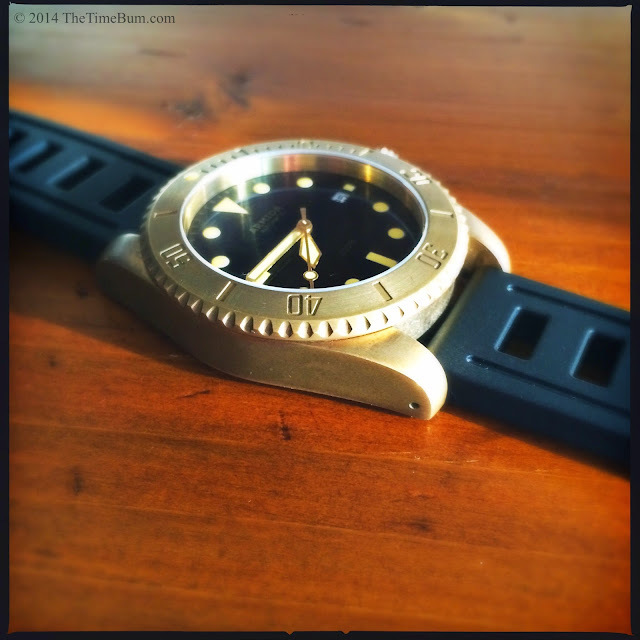 Paul's is a black, date, vintage lume model that arrived with the brass bezel installed. The bezels can swapped at home by simply prying off the one and pressing the other into place, but considering that this was someone's personal timepiece, I decided to leave well enough alone. The black bezel looks great, but I prefer the engraved version. 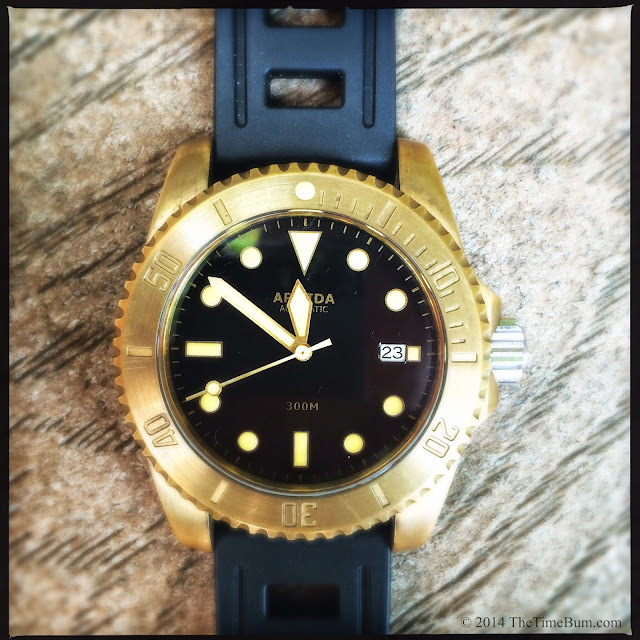 The dial is glossy black with gold text and indicies. The sword hands are brass and filled with "vintage" color lume, as are the markers, and the lollypop second hand. I was skeptical of the vintage lume, as many watchmaker's attempts turn out to be a bright pumpkin orange, which may be a cool color in and of itself, but not a particularly subtle one, and nothing like aged lume. The orange lume on the A8 was rather sedate, and worked well with the brass case, the gold and orange tones creating the desired "lived in" look. 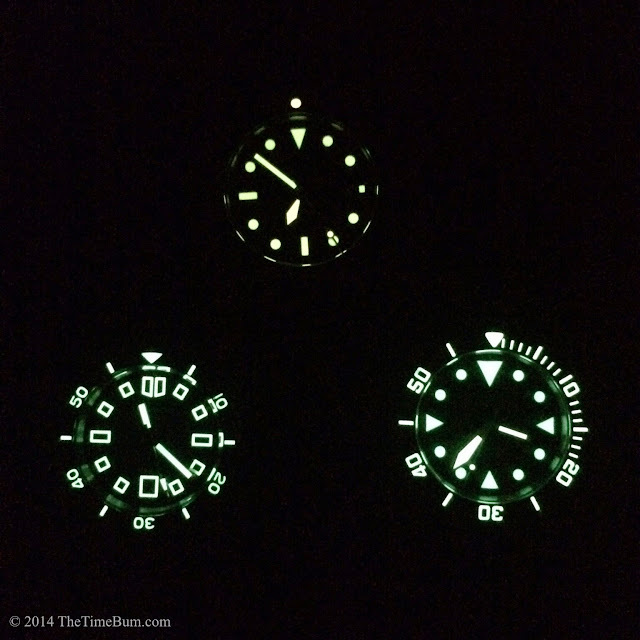 Night time glow was not as potent as a green-white C3, but as you can see from the photo below, still quite bright (A8 on top, C3 lumed Helson Spear Diver and Shark Diver below). My biggest issue was not with the color of the lume, but that of the date wheel. The black-on-white would have worked fine with C3, but near the pale orange, it just seemed out of place. 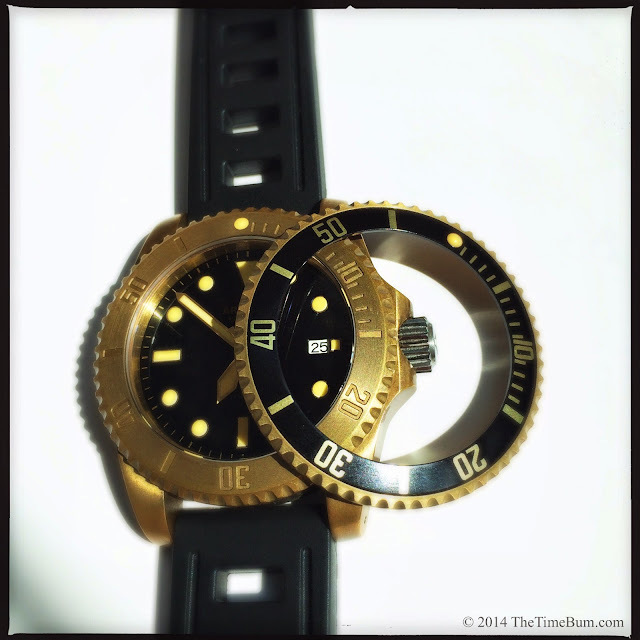 With a 42mm case the A8 is slightly smaller than many Panerai-inspired bronzos, but it is still a large diver. It is just over 13mm thick, 52mm lug-to-lug, and has an aggressively toothed and slightly oversized 43mm bezel. Fat, drilled lugs are positioned near the outer limit of the round case. The 8mm crown is signed and recessed into a brawny guard. The case has flat sides and there is very little curvature to the underside of the lugs, so the watch does not wrap around your wrist, it sits on it. These are all design choices that maximize the surface area of the watch and emphasize its overall dimensions. Suffice to say, it is not lacking in presence. The A8 strikes a nice balance for those of us with smaller wrists. It looks oversize, but it does not overwhelm. The burly looks are not just a show. 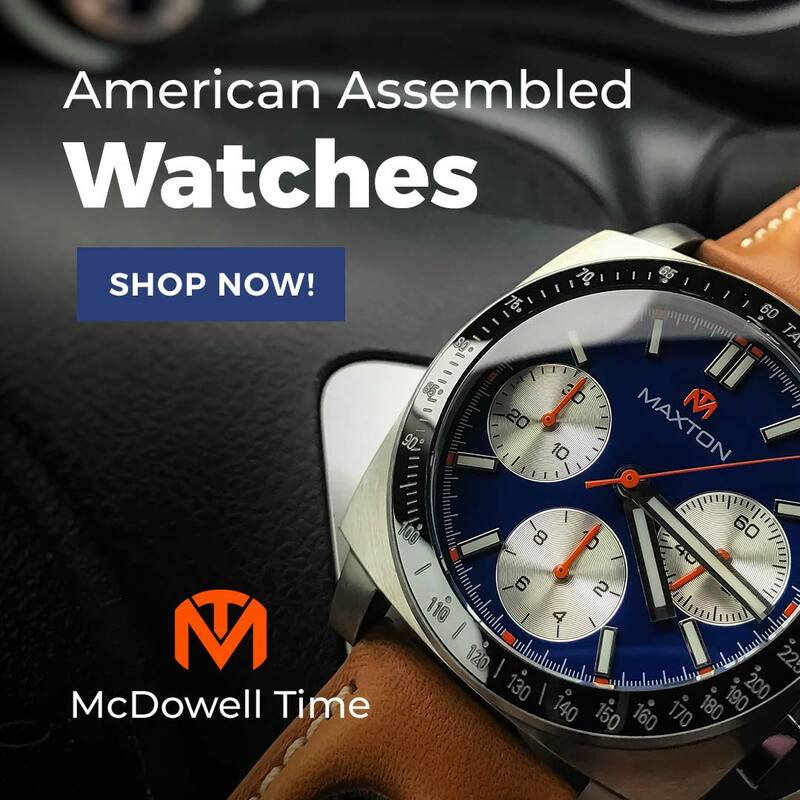 The A8 was built to be a legitimate tool watch and it has the tech specs to back it up, including a 120-click unidirectional bezel, 2.5mm sapphire crystal with anti-reflective coating, screw down crown, and 300m water resistance rating. Strap options are strictly utilitarian. The watch ships with two 22mm straps: a black Zulu in heavy weave nylon with brass hardware, and rubber Isofrane style (possibly a Cuda?) with a signed, brass Pre-V buckle. Of the two, I preferred the soft black rubber. It was comfortable on the wrist and its thickness balanced the watch's bulk better than the thinner nylon. The only downside was that the buckle's huge frame happened to jut outwards just enough to catch on everything it encountered. Of course, if the watch were mine, I would lose them both and wear it on leather. Something cut from a vintage ammo bag would do nicely. The case back is stainless steel and decorated with what I have previously described as the Armida Buckyball. The crown is also stainless steel, a decision that may seem odd on a brass case, but which is driven by necessity as the very oxidization that makes the material so appealing also makes it susceptible to fusing. Inside the case, a Seiko NH35a automatic makes it all work. This is an update on the old faithful 7s36. Comparing the Seiko to the popular Miyota 9015, you will notice they are both 24 jewel units with hacking and hand winding capabilities, and a 40 hour power reserve. The Miyota runs at 28.8k bpm versus the Seiko's 21.6k; however, the Seiko is less expensive, and unlike the Miyota, it betrays no rotor noise. I have sampled both movements in several watches, and while I appreciate the smooth sweep of the Miyota, I do have to wonder why more micro brands are not opting for the cheaper, quieter Seiko. As of this writing, the vintage lume versions of the A8 have sold out, as have those with the date window, leaving only the black and green no-date watches. I think the dial looks cleaner without the date, and while I liked the vintage/black combination, I would choose the C3/green for myself. 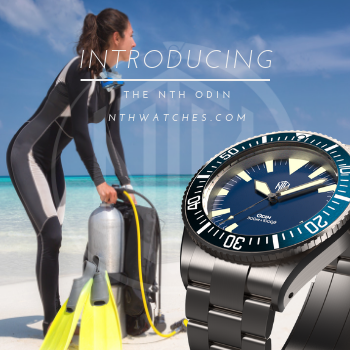 Armida has packed quite a bit of watchy goodness into the A8: sapphire, high water resistance, two straps, two bezels, bright lume, and a look that stands out among the crowded field of divers. Even better, they have brought us this little brute for the Bum friendly price of $349, including international shipping. Armida buyers looking for a different shape can try the $369 brass cushion case model, which also adds a ceramic bezel insert. If you really want CuSn8 bronze and a Miyota 9015 instead of the brass and a Seiko NH35a, they will be happy to sell you a model A1 for $999. I am pleased that they offer both options, but for my money, I'll happily take an A7 or A8 and keep the extra $630+ in my pocket. Pro: Distinctive looks, two bezels, and a fantastic price. Con: Awkward buckle position on my wrist. White date is not a good match with the orange lume, but this is no longer relevant. Sum: Another winner from Armida. The Time Bum approves.